With Super Bowl Sunday in the rear-view mirror and the National Football League Draft coming later this week, which brands are best positioned to leverage the affinity football fans have with their own products and services? Last fall, the once indestructible live-viewing NFL audience was starting to show some cracks. The league’s misfortunes did reverse as the season progressed, but even the temporary decline speaks to the importance of keeping your finger on the pulse of an audience and how your brand relates to them. Social media engagement is at such tremendous scale that marketers with the right partner can determine which TV show, celebrity or YouTube channel is most engaged with its brand. By monitoring these social interactions daily, they get a near-real-time view into how brand audiences’ social engagements change over time. This creates a feedback loop where affinity plays a key role in strategy, activation/execution and measurement—every association that the consumer makes with a brand has the potential to be a new audience that brand can target. 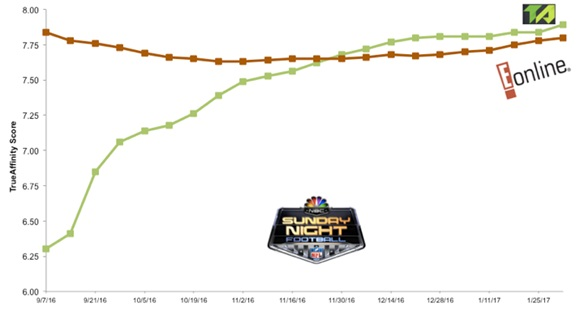 Last fall, when Sunday Night Football was experiencing its ratings decline, E! Online was home to some of its digital ads, according to Moat Pro. As shown in the chart below, while it was maintaining social affinity with SNF, website Trailer Addict’s social affinity with the program grew 25 percent. That’s not to say that Trailer Addict is necessarily a better ad buy for Sunday Night Football, but audiences’ loyalty and attention are constantly shifting in the current media landscape. Leveraging Trailer Addict’s audiences in programmatic or targeting them on social are opportunities to bring them into the SNF fold. This premise doesn’t just apply to sports franchises. 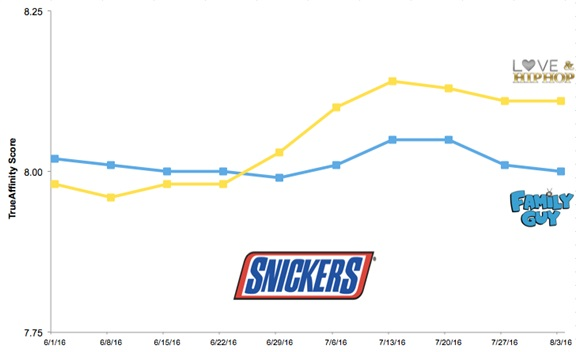 Even a brand like Snickers should constantly have its finger on the social affinity pulse. Charting just two TV show affinities demonstrates how preferences of Snickers engagers—made up of both existing Snickers buyers and prospective new audiences—can evolve. In the spring of 2016, the top TV show affinity for Snickers fans was Family Guy, but by the end of June, Love & Hip Hop surpassed it and has remained the top TV show ever since. Running TV ads in or creating branded content with Love & Hip Hop to move the needle even more and create a more receptive audience base for Snickers among fans of the show. Using Love & Hip Hop and related terms or phrases to extend reach and relevancy in social, mobile, display or search campaigns. Activating these audiences via programmatic branding. How a marketer engages with social affinity data depends on that marketer’s goals. Engaging continuously with consumers is presumably easier for products with longer purchase cycles, such as automobiles, where service reminders are easy points of entry. Social affinities offer a way to level the playing field. With social affinities as part of their marketing toolbox, even brands that have a consumer journey as short as the trip to the checkout counter will have a way to find their next best customer. Acquiring new customers is the best way to grow a brand, and nothing demonstrates more value to current consumers than a brand that relates to them in the most relevant context. 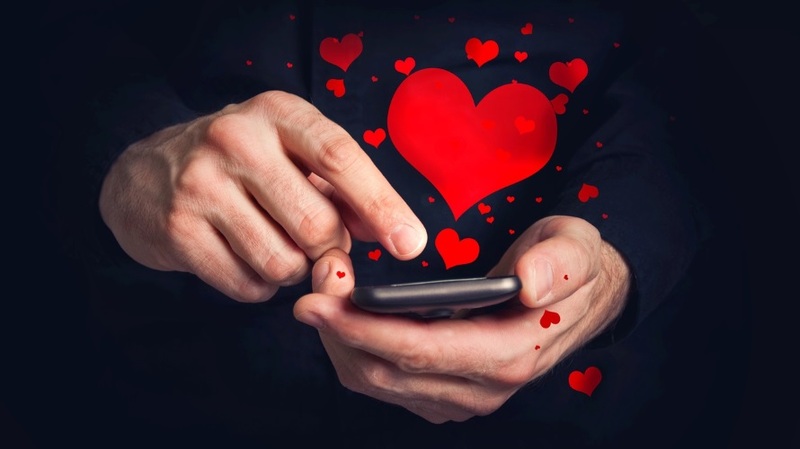 Using social affinities to find the most relevant context is like getting a loved one the perfect gift. You can ask them what they want or get them something based on what they already have, or you can actively listen for clues and signals that will help you predict what they want, which is what measuring social affinities can do for brands. As many experts will tell you, discovery keeps relationships—both business and personal—exciting and rewarding. J.T. Compeau is a client services lead at predictive branding platform AffinityAnswers.